while worker man was out of town one week, i decided that i was going to tackle our bathroom. it's small and i had not done anything to it since we got married. he had painted it a tan-ish color. the shower curtain was a couple of shades of tan-ish [yes, that's the official name :)]. and it was just pretty blah. so, i decided it needed a revamp. 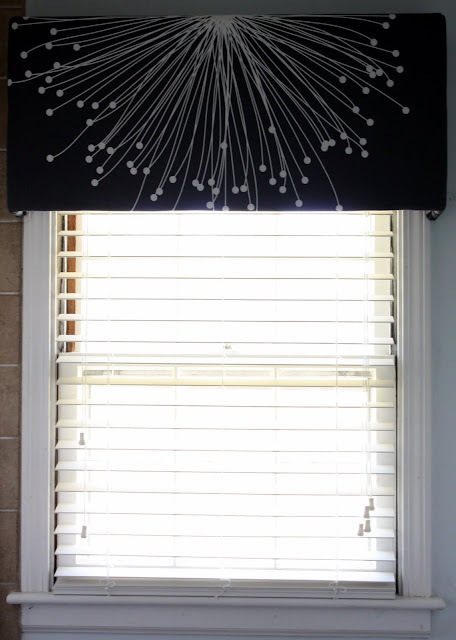 i saw this tutorial by Jenny at Pearl Street Interiors and I knew that it would work well in the bathroom. so, i found some fabric at ikea and again, enlisted my dad's help. sidenote: he claims i'm high maintenance. when worker man is out of town and i spend the night with my parents, i always bring a project. and he claims i'm high maintenance. mostly because all the projects i bring are the ones that he does and i stand around and take pictures and provide moral support. but [warning: sappy] i love it - i'm always so grateful for those nights. i painted the walls a light blue [can't remember the name]. i found the rug at home goods. sidenote: i was looking for the rug one night with my sister and i showed her what i wanted. she rubbed it and proceeded to yell out "ohhhhh....it's like phalanges!!!". and people starting staring. it was ackward. i can always thank her for those moments. i decided to order a 95" white, waffle shower curtain from target. 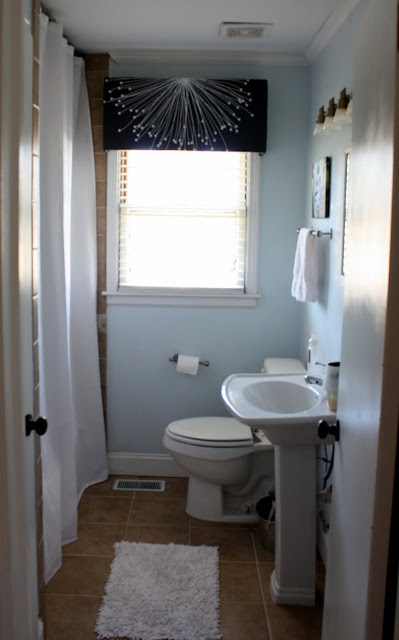 [a taller shower curtain makes the room seem a little bigger - which is much needed in the tiny bathroom]. here's an upclose of the pelmet box. worker man was suprised and liked it. [he did not like my paint job - considering he's going to have to paint the third coat because his wife is impatient and has a.d.d]. Love it! Love it!! And it looks even BETTER in person!! That looks great! You are so smart to be high-maintenance!!! HA HA! !